Ceramic Pro is designed to protect your factory clear coat, to provide a protective shield against the elements and to keep your vehicle looking new always. To maximize the effects of Ceramic Pro and to ensure your investment is long lasting, a few basic maintenance steps should be taken. With simple care, your coating will reward you for years to come. The coating can help prevent your clear coat from water spots as it is hydrophobic. Ceramic Pro however is not bullet proof and can still get hard water spots. The coating is less likely to etch than your factory clear, but it can especially get water spots during the curing process and can be costly to remove. Parking under a shedding tree. Allowing bird droppings, sap or pollen to sit on the car and bake in the sun. If you notice that your car gets water spots, bird droppings, tree sap etc. during the first two weeks, immediately remove it following our care instructions. Keep in mind the coating is soft; be gentle when working on the paint. Quickest method if at home is to warm a kettle & pour over. This will soften & loosen making it easy to rinse or gently wipe away with microfiber cloth. Pressure wash if accessible. Remember monthly use of ceramic pro sport will keep your paint & other surfaces slick. Smooth surface doesn’t allow dirt to stick. Ceramic Pro is extremely slick, this means most things will dissolve and be pulled off by Ceramic Pro’s self-cleaning effect. Minimizing rubbing, (especially with a dry towel) on the coating will ensure its longevity. Dry bird droppings, bugs and tree sap can be dissolved using alcohol type solvents and wiped off with a damp microfiber towel. For best results the car should be washed on a bi-weekly basis to avoid excessive contamination build-up. Use only recommended mild car shampoo. Avoid high volume brush style or hand car washes, and high PH detergent style cleaners. Avoid washing in direct sunlight to minimize streaking and water spotting. Wash from the top down leaving the dirtiest sections for last to avoid cross contamination. Always dry the vehicle using high quality microfibre drying towel. Ceramic pro sport is highly recommended at least once a month. Wash bug splatter & bird droppings immediately. Use a foam gun to loosen dirt. Rinse it off with a pressure washer or hose. Hand wash (be gentle no need for elbow grease) using clean microfiber wash mitts & Dry with clean microfiber towels. Select the high pressure soap. Soap the car down (never use the provided brushes especially on the paint!). Rinse car off with the high pressure rinse. Dry with clean microfiber towels. Touch-less car washes only. Never use a car wash with brushes! Never select the “spray wax” option. Always dry completely and never leave to “air” dry. Tap water contains minerals that may leave deposits creating water spots. Only use quality microfiber towels for best results and avoid aggressive wiping, allowing the material to absorb the water. Never use aggressive products to polish the coating or remove surface contamination. Never use excessive force to remove spots. Bird droppings, tar, sap, etc. should be removed as soon as possible to avoid temporary staining or hardening on the coating. Any staining left behind from bird droppings will break down over a few days without affecting the coating. Always go to a touch free wash! Using an automated car wash with brushes will void the warranty and dull the coating. 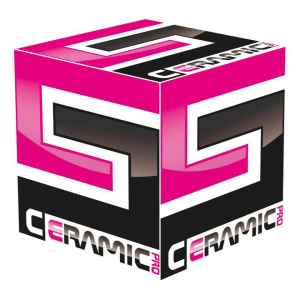 Ceramic Pro 9H takes up to 2 weeks to achieve full hardness. Please handle with care and do not wash the vehicle for the first 2 weeks. For best results, all leather,plastic,vinyl surfaces should be cleaned bi- weekly with a mild all purpose interior cleaner to avoid contaminant build-up ( always spray on cloth not directly on surfaces). Ceramic pro sport is recommended every two months for interior top up. Vacuum carpets regularly and use carpet & fabric cleaners when necessary. Immediately wipe off spills on leather, vinyl, or fabric. After wash use ceramic pro sport as a top up to replenish nano hairs. Simply spray onto microfiber cloth & wipe down alloy wheels, glass surfaces. Annual Inspections are the recommended process for ensuring the coating is maintained and care for the vehicle is properly executed. Annual inspections should be carried out by an approved applicator within 30 days before the anniversary date of the last service to ensure peak performance. Although durable and long lasting, annual inspections ensure maximum gloss and protection from Ceramic Pro coating.